PLEASE READ THESE TERMS AND CONDITIONS ("CONDITIONS") BEFORE SUBSCRIBING FOR SERVICES. RANGERStv.tv RESERVE THE RIGHT, AT ANY TIME, TO MODIFY THESE CONDITIONS BY POSTING A REVISED VERSION ON THIS WEBSITE. YOU ACKNOWLEDGE THAT YOU HAVE READ AND UNDERSTOOD (AND AGREE TO BE BOUND BY) THESE CONDITIONS NOW AND EVERY TIME YOU USE THE SERVICES. BY CONTINUING TO USE THE SERVICES YOU ACCEPT ANY REVISED VERSION. In clicking on the "Continue" button on the package selection page, you are entering into a legally binding contract with Rangers.co.uk Limited (the service known as RANGERSTV.tv) to purchase the Services. The contract is conditional on payment being authorised by your card issuer and is at all times subject to these Conditions. Our prices only cover access to the Services. Telephone line and other communications or access costs may be charged to you separately by your ISP or relevant service provider. All our prices are inclusive of UK VAT at the rates in force from time to time. Except in the case of manifest error, the prices payable for the Services that you order are as set out on this website at the time at which your order is placed and or subsequently renewed. Payments are made in £GBP and where relevant $US are noted for ease of use. Payments may be made by Mastercard, Visa, Solo Visa Delta Electron, Maestro PayPal Mastercard Securecode Verified By Visa. You confirm that the credit/debit card which is being used is yours. All credit/debit card holders are subject to validation checks and authorisation by the card issuer. RANGERSTV.tv. reserves the right to refuse credit/debit card payments in its reasonable discretion. RBS Worldpay will process your payment on a secure site. The Unlimited membership entitles you to watch every SPL match live where we have an outside broadcast available and where we have the required rights. Cancellation must be made no less than 24 hours or 10 working days prior to the end of the day, month or year (depending on whether you are paying monthly or annually respectively) for which you have paid. If you cancel prior to this 24 hour or 10 working day period access to the Services will be terminated at the end of the relevant period. If you cancel during this 24 hour or 10 working day period you will be charged for the following month, year or relevant period and access to the Services will terminate on expiry of that day or following month. If you cancel your subscription after your renewal date you will be charged for the following day or month, year or relevant period and access to the Services will terminate on expiry of that following day or month, year or relevant period. RANGERSTV.tv may terminate this agreement with immediate effect and by written notice at any time if you commit a material breach of this agreement (and any breach of clause 2 or 7 will be considered to be a material breach). Except under clause 3, you will not be able to cancel your Subscription Contract once your subscription application has been submitted and access to the Subscription Areas has been granted. The 'Services' shall be the provision to you of access to RANGERSTV.tv services on this Website including the live match and live feeds. HoweverRANGERSTV.tv reserves the right to amend the nature and extent of the Services available at any time. You will need to load your PC/MAC with Windows Media Player software,or Flash Player (which you will need to obtain) and you will be permitted to access the Services only from this PC/MAC. You are responsible for ensuring that you have and maintain all the hardware and software necessary to access, receive and view the Services. In the event that RANGERSTV.tv reasonably determines that you do not meet these requirementsRANGERSTV.tv reserves the right to refuse the provision of Services to you. In such a case you will be entitled to a refund of any sums paid as provided for in clause 3 ("Our right to terminate"). 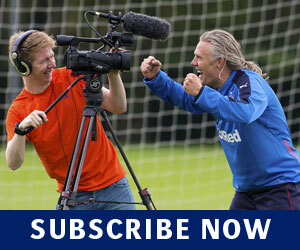 RANGERSTV.tv will use its reasonable endeavours to ensure that the Services are made available to you at all times. However, this Website is provided on an "as is" basis. In particular, the image and sound quality of the Services may vary, whether due to congestion on the internet or telephone lines or otherwise. The Website may not be uninterrupted, timely, secure or error-free. From time to time we will need to close the Website to carry out upgrades or maintenance. We will try to keep this to a minimum. Subject to the constraints described above, RANGERSTV.tv will carry out the Services with reasonable care and skill. Apart from this we make no representation or warranty (and exclude all warranties and conditions otherwise implied, to the fullest extent permitted by law). This does not affect any other statutory rights you may have as a consumer. You can contactRANGERSTV.tv whether to discuss technical problems or trace your subscription, or for any other reason by emailing to [email protected] as described below or going to the Contact Us section. In all instances, please be ready to give your customer ID, product details, last transaction ID, postcode and date of birth, which RANGERSTV.tv will require from you in order to identify your subscription. Any notice given by RANGERSTV.tv can be given by post or email to the most recent postal or email address we hold for you. Transmission or postal failures are at your risk, and we cannot be responsible for non-receipt of messages we send you. The design, text, graphics, footage, images and other feed you receive (and any selection or arrangement) are subject to the copyright of Rangers.co.uk Ltd. and others. use the Services for non-commercial purposes only without making any gain and that you will not permit any other person or persons to use the Services. This means, for example, that you must not charge for viewing of the Services and that you cannot use the Services to attract others to buy goods or Services from you or anyone else; at any given time, only view the Services via your permitted PC/Mac and never permit any other person to access the Services. You must keep your password secure and never share passwords or other access codes with anyone or in any way make them accessible to others; not copy, record or store all or any part of the Services (other than on a purely transitory basis to permit you to view them) or divert, re-transmit or otherwise distribute all or any part of the Services to any person, or authorise, enable or procure any other person to do any of the above; not alter, disassemble, decompile or reverse engineer any part of the Services; not view the Services in circumstances where members of the public can view them simultaneously or authorise, enable or procure any other person to do so; and not abuse this Website or use it for any unlawful or unauthorised purpose (which includes transmitting any computer viruses through the site, or using the site in a manner which violates or infringes the rights of anyone else). As well as our right to terminate for breaches by you (clause 3) we may suspend the Services (or your access to them) if your use of them is abusive, excessive or against the interests of other subscribers or in breach of these Conditions or our Website Terms and Conditions, or if we are requested to do so by a regulatory authority. Your username and password is unique to you and for your use only. If you allow others to use your username to access live matches for which they have not paid, access will be blocked on all accounts with that username for that match. Simultaneous use of a unique username and password will be monitored for abuse. If more than 2 instances of use are detected services will be blocked with immediate effect. 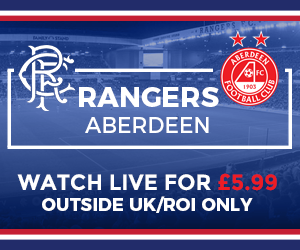 Rangers TV membership is for individuals - this includes Pay Per View services. The service is not for viewing in commercial or other premises where more than one individual can view the service unless otherwise agreed in advance. ANY DIRECT LOSS IN EXCESS OF THE PAYMENT AMOUNT; OR ANY CORRUPTION TO DATA OR ANY INDIRECT OR CONSEQUENTIAL LOSS WHATSOEVEREVEN IF IT HAS BEEN ADVISED OF THE POSSIBILITY OF SUCH LOSS OR SHOULD REASONABLY KNOW OF SUCH LOSS. NOTHING IN THESE CONDITIONS SHALL EXCLUDE OR LIMIT THE LIABILITY OF RANGERSTV.tv AND the Club FOR DEATH OR PERSONAL INJURY DUE TO ITS NEGLIGENCE OR FOR ITS FRAUD. THIS DOES NOT AFFECT YOUR STATUTORY RIGHTS AS A CONSUMER. It is good practice, and it is your responsibility, to take adequate steps to protect against viruses and suchlike.The information and data ("personal data") which is provided by you in connection with this site will be held on the computers and manual records of, and will be used by, RANGERSTV.tv, the Club and the Club's sponsors, affiliates, official suppliers and any other reputable suppliers of goods and services which RANGERSTV.tv. or the Club believe may be of interest to you (together "the companies"). A complete list of all such companies is available on request from the address below. to enable the companies to review, develop and improve the services offered by them. The companies may inform you from time to time by email, telephone, or mail about relevant news, information, promotions, services and products offered by any of them which they believe may be of interest to you. If you do not wish this to happen, please ensure that you untick the appropriate box when you register your personal details. By law you are entitled, upon payment of a fee, to receive a copy of information or data about you which is held by any of the companies. You are also entitled to require the rectification, erasure or blocking or any such information or data which is inaccurate or not up-to-date and held by the companies. If you wish to exercise any of these rights, or if you wish to opt-out of any future processing of your information or data held by the companies, please write to the address below stating your full name and address and providing any other relevant information. RANGERSTV.tv, Rangers.co.uk shall not have any liability to you for any delay or failure to deliver the Services to the extent that such delay or failure to deliver arises from causes beyond the reasonable control of RANGERSTV.tv, rangers.co.uk including, but not limited to, the failure of electronic or mechanical equipment or communication lines, third party action (including denial of service attack and overuse or misuse of the Services), telephone or other inter connect problems, computer viruses, unauthorised access, theft, operator errors, fire, severe weather conditions, including floods, acts of God, acts or regulations of any regulatory, governmental or supranational authority, war, riot, strike, lock-out, industrial disputes and the cancellation or postponement (by any football club or body) of any relevant football match). If this means that you fail to receive a substantial element of the Services RANGERStv.tv will refund such proportion of the sum pre-paid by you in respect of the Services as it decides, acting reasonably, is fair in the circumstances. No waiver by RANGERSTV.tv registered in Scotland No 341992 and its place of business at The Rangers Football Club PLC (Registered in Scotland SC004276), Ibrox Stadium, Glasgow G51 2XD shall be construed as a waiver of any rights or remedies, or any subsequent breach of any provision of these Conditions. These Conditions together with the current Services prices and contact details on this website, set out the whole of the agreement between you and RANGERSTV.tv. This agreement cannot be changed or terminated orally, and no changes or amendments to this agreement shall be binding upon the parties until confirmed in writing by RANGERSTV.tv. You confirm that you do not rely on, and waive any claims for breach of, any such representations which are not so confirmed. (a) Clauses 7, 8 and 9 of these Conditions confer a benefit on the Club and are intended to be enforceable by the Club by virtue of the Contracts (Rights of Third Parties) Act 1999. (b) Except as provided in clause 12(a), a person who is not a party to the contract governed by these Conditions has no rights under the Contracts (Rights of Third Parties) Act 1999 to enforce any provision of these Conditions but this does not affect any right or remedy of a third party which exists or is available apart from that Act. This Agreement is governed and construed under the laws of Scotland and any claim, dispute or matter arising under or in connection with it or its enforceability shall be governed by and construed in accordance with the law of Scotland.